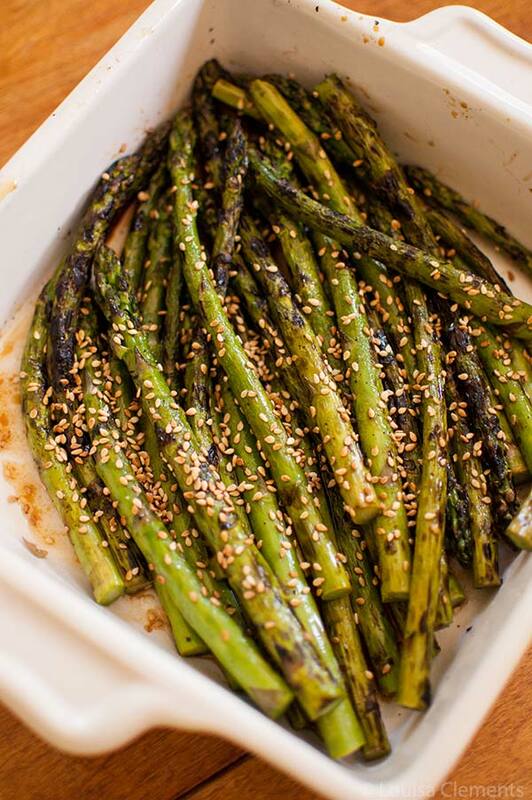 Add an Asian twist to your barbecue with this simple side dish of grilled asparagus tossed in a sesame dressing and scattered with toasted sesame seeds. The local asparagus that is available right now is phenomenal and this grilled asparagus is something I’ve been making nonstop for the past couple of weeks. Whenever I enjoy in-season produce, it makes me wonder why on earth I would ever eat asparagus (or any fruit or vegetable for that matter) out of season. 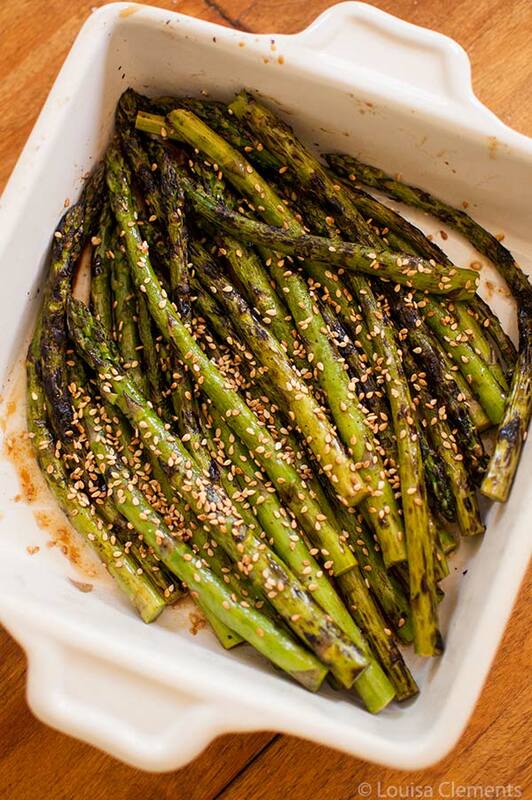 This recipe is so simple, first, gill up some asparagus (which, in my opinion, is the only way to eat asparagus these days), then toss it with an Asian-inspired dressing made up of sesame oil, soy sauce and rice vinegar and finally, toss in some toasted sesame seeds for a little texture. It’s the perfect side dish for your weekend barbecue. I used to talk about movies on here all the time, which I haven’t for a while, I think it’s because I did so much writing about movies for school in such an analytical and theoretical manner that I was just kind of burnt out. Well, the other day I saw Noah Baumbach’s latest While We’re Young and I just loved it so much that I have to talk about it on here. Have you seen it? The film explores the “generation gap” of sorts between generation X and millennials, following the relationship between a couple in their forties, played by Ben Stiller and Naomi Watts and a couple in their twenties, played by Adam Driver and Amanda Seyfried. The way this gap is shown is so fascinating to me, the younger couple are sort of the epitome of millennials, with all of our good and not-so-good components and beliefs. It’s an observational comedy that is definitely more accessible and perhaps appealable than Baumbach’s previous films, like Frances Ha (a black and white film which I also loved). Both the two male characters, Josh and Jamie, are documentary filmmakers, which as someone who struggled making my own documentary over the past year and a half, was just another element that I loved and could really relate to–it had a bit of that artist/commercialism vibe to it which is always fascinating. Definitely recommend seeing this one if you’re a fan of Baumbach’s work–and even if you’re not! I also saw Mad Max the other day – woah. A feminist action film that questions the male gaze? Sign me up. My film school radar was going off like crazy. It made me wish I was still in university because I would love to write a paper or discuss that film with a couple of my film studies professors. But alas, timing is an interesting thing. Have you been spending your weekends outside grilling up a storm? I sure have and recommend you give this grilled asparagus a try or some other grilled vegetables favourites and even a burger if you’re feeling like something more traditional. Simple and flavourful; asparagus is a spring favourite that becomes smoky and sweet when it hits the grill. This is the perfect side dish packed with Asian flavours like sesame, to go along with grilled salmon. Toss asparagus in canola oil in a large bowl. In a small bowl, whisk together ingredients for dressing. Barbecue asparagus, turning often until lightly charred and cooked through, about 6-8 minutes. Toss with dressing and sprinkle with sesame seeds. Let me know if you give this grilled asparagus recipe a try, it’s perfect for spring-time grilling.